There are approximately 110 million off-grid households in Africa and in Sub-Saharan Africa only 9% of the rural population has access to electricity. An estimated 58.3 million of those without grid access are using kerosene to light their homes. In Kenya for example 92% of the population uses kerosene for lighting. However, kerosene is expensive, typically accounting for 10 – 15% of total household income. It is bad for people’s health and the World Bank estimates that breathing kerosene fumes is the equivalent of smoking two packets of cigarettes a day. If this wasn’t enough, a single kerosene lamp emits one tone of carbon dioxide over five years. CO2balance’s long term vision upon realizing financing goals is to distribute 10,000 solar lamps to rural communities in Africa that are most at need. Moreover, there will be several significant impacts from this project across the environment, society, people’s health and the overall well-being. The tables below present the significant impacts of the project such as 2,000 tco2e will avoided from being released to the atmosphere in each year. 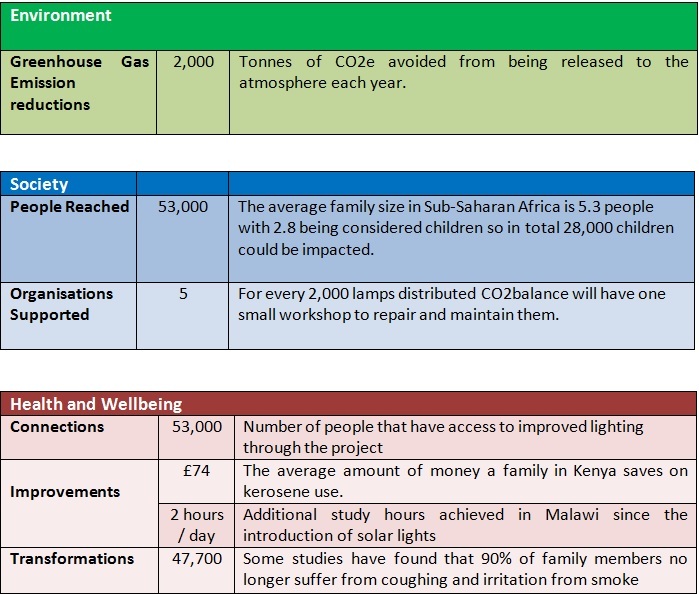 In addition, a family in Kenya could saves £74 on average on kerosene use and young people can study 2 more hours per day. Across the globe, around 780 million people lack access to safe water supplies, which equates to approximately one in eight (JMP, 2012). In Africa alone, around one third of the continent’s population are without access to clean water and UNICEF estimates that over 1.5 million child deaths per year are caused as a result of drinking contaminated water (UNICEF/WHO, 2009). Over the last few decades, rural water demand in developing countries has primarily been addressed through the large-scale implementation of decentralized water points such as boreholes and shallow wells. However, one of the major barriers to clean water provision is that many countries do not have the infrastructure, regulation or financial capacity to conduct maintenance and repair programs. 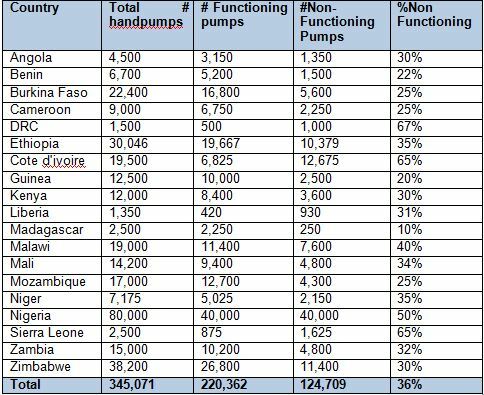 In Africa, existing water points are generally owned by community groups or Village Health and Water Committee (VHWC’s) and more often than not fall into disrepair because maintenance schemes have been poorly managed, or prove too expensive. Despite millions of pounds being invested in new water infrastructure there is evidently a greater need to implement effective long-term water management programs that prevent existing water points from becoming damaged. CO2balance are currently exploring innovative new ways to tackle this problem through carbon finance, which could indeed provide a viable means of addressing water scarcity across the developing world. In Karindundu Village in Mathira meet a very cheerful elderly mother by the name Martha Wangari. She lives with her husband in their farm. As she welcomes us to her homestead, she offers to prepare us some tea. She went out in her field around the homestead to collect some firewood. She was only out for a few minutes and she returned with only a small buddle of fire wood in her hand. “hii kuni haiwezi pika chai ukitumia jiko yangu ya zamani. Lakini kwa hii jiko mpya,tutapika chai n a hii kuni haitamalizika” (She says if she were using her 3-stone stove, that amount of firewood would be barely enough to cook tea. But using the CZ stove, she will use the firewood and the buddle won’t be spent). As we wait for the tea to be ready, the environment in the kitchen is fresh and free of smoke. She smiles happily and says:“ kama tungekua tunatumia jiko yangu ya zamani, mungekua mumeketi huko nje kwa sababu ya moshi” (She says, if she were using her old 3- stone stove, the environment in her kitchen would have been very uncomfortable due to a lot of smoke). 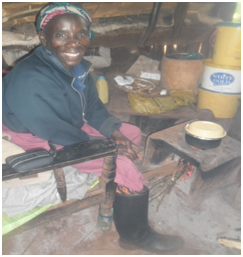 She continued to share with us how cooking was always a nightmare to her before she received the new CZK stove. She says that excess smoke caused her a lot of sneezing and coughing. As we bid her goodbye, she also thanked the CZK Company for a life changing experience that she is always proud of. In the past weeks we have analysed several monitoring studies conducted for the VPA 1 Bugesera Improved Cook Stoves (GS 1267) project and we were very pleased to receive such positive feedbacks on the project from our stove users. The Kitchen Performance Test aimed to provide a quantified figure of the actual wood saving of the stove, while the Kitchen Surveys provided more qualitative data on the experience of using improved stove in the household. All respondents interviewed for the Kitchen Surveys answered that they are happy with the improved stoves and use it on average twice a day. 77% of the interviewees indicated that the stove used less wood, while 12% and 10% appreciated that the improved stove reduced cooking time and produced less smoke respectively. In line with this founding, 94% of stove users answered that they enjoyed faster cooking since using the improved cookstove. The Kitchen Surveys also explored the wood use before and after the project to triangulate the quantitative data from the Kitchen Performance Tests on the changes in wood use. The data from the Kitchen Performance Tests showed that the average wood consumption decreased as a result of the project (from 13.62 to 3.22 kg/hh/day) and the answers in the Kitchen Surveys reinforced the assumptions that it lead to improved health and socio-economic conditions of the households. According to the answers the smoke level in the households decreased significantly, as 85% of the respondents noticed less smoke produced by the co2balance designed “Gabanyibicanwa stove “ compared to the 3-stone fire. 54% of the people told that their overall health condition improved after adopting the improved cookstove while 23%-23% noted less coughing and less eye irritation. Combined with wood fuel measurements taken during the Baseline Survey it is clear that use of the stove results in a cleaner and healthier cooking environment. 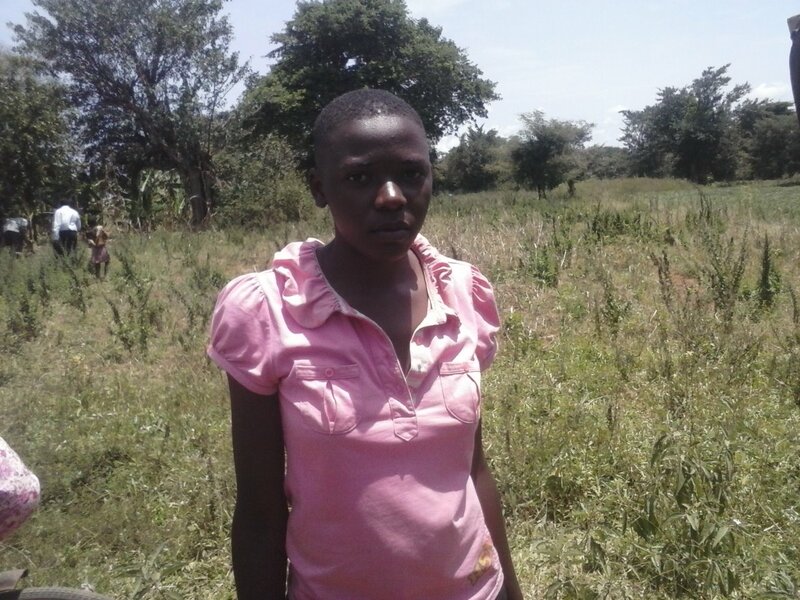 Ruth Nanyanzi is a Form 3 student of Iganga girls Secondary School. She comes from the village of Iguliryo in Kaliro district in Eastern Uganda. Every holiday she spends a week at home in the village. Her village is not connected into the national grid and so she is restricted to daytime hours to get that extra study needed to compete with the students from the urban areas of the country who get extra hours in the night to do their holiday study. 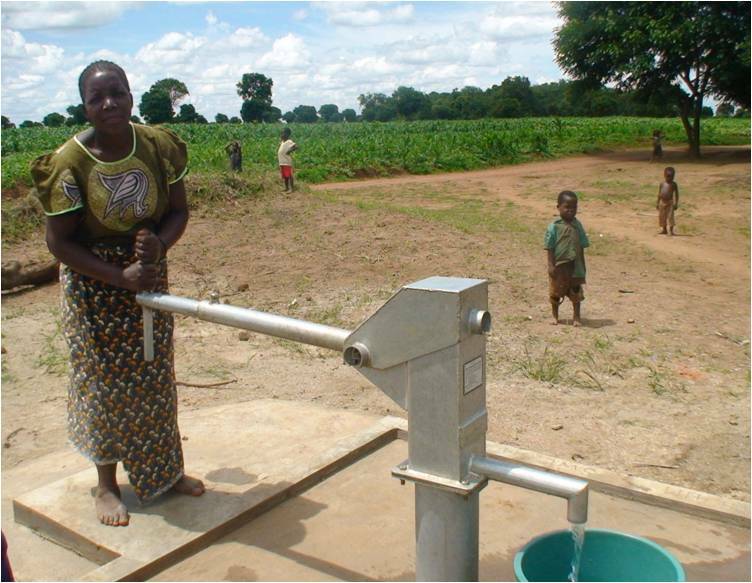 Currently her home is located 2km away fro the nearest borehole. She has to go there three times every day which adds to a total of 12 kms. This makes her lose a lot of time that could have been used for study and as a result she has much less time for study and for her social time as well. 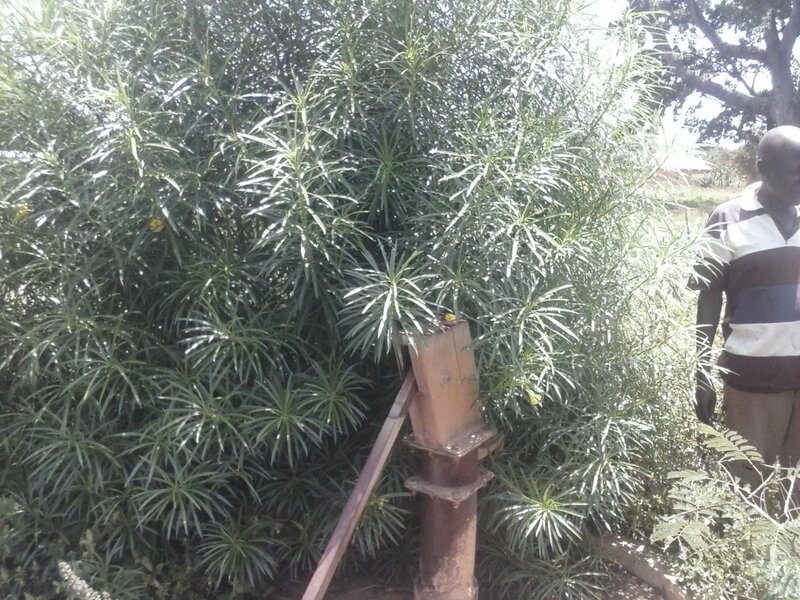 However, there is a borehole right in front of the house where she lives that has been non functional for about 5 years. When I first went to this area, I did not recognize it as it had been overgrown by a bush in the middle of the garden. 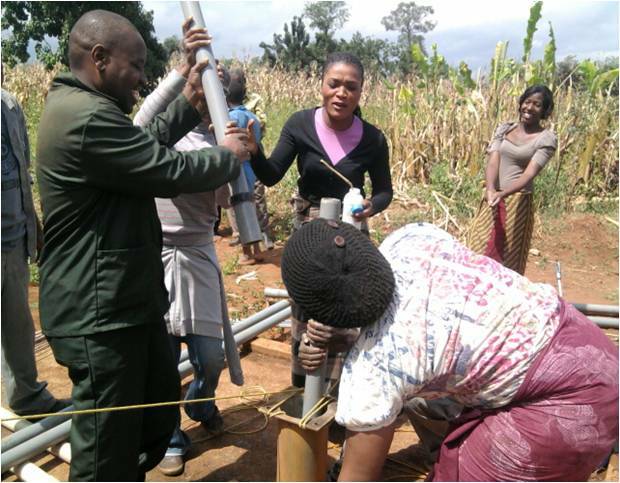 Presently this borehole has been rehabilitated, much to the delight of the community. Ruth is currently at school preparing for what we used to call “Moscow” exams ( the exams the year before finals). When she gets home and gets the motions going to prepare for her final year, she will be extayic at the prospect of going 12 km less every day to collect safe water.